The Otis Ridge Ski Camp, in its 70th season, is one of the oldest operating ski camps in the country. Scheduled during school vacation periods, Camp is open to skiers & riders ages 8-15, all levels, who want to improve their skills and have fun in the process. The ski camp is located on the other side of the hill, at the end of Judd Road, in a separate facility offering rustic accommodations. To introduce beginners to sound, modern, ski techniques. 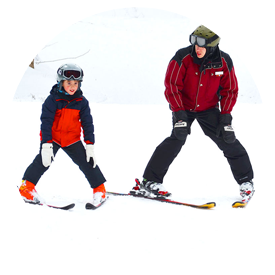 To teach young skiers the steps which lead to greater skill and confidence. To provide a foundation in skiing which cannot be duplicated in one-hour classes. To help advanced skiers polish their technique. To provide varied recreational activities. To launch our campers on a lifetime of skiing competence and fun. To develop the most advanced teaching methods. Includes bed, board, instruction, lift tickets and supervision, both during and outside skiing hours. Tuition does not include rental equipment, charter bus, taxis or medical expenses if any of these are required. Tuition is due at least 4 weeks in advance of the scheduled session. Download the Ski Camp Planning kit for more information. Like paper forms instead? Here they are.